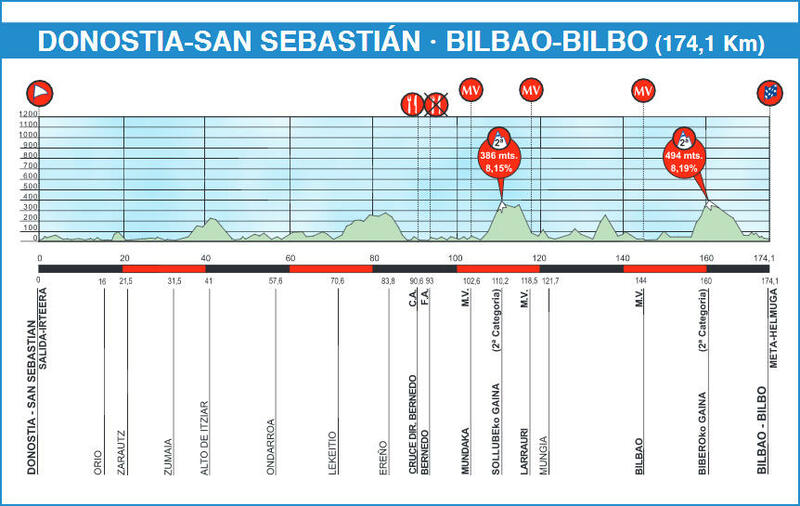 Today’s route traces the coast between San Sebastián and Bilbao. Of the climbs that the riders will encounter, only two are categorized – Sollube and Vivero, both 2nd-category – but there are more ups and downs than the profile image emphasizes. Climbs at Orio, Itziar and Ereño, for instance, will add to the cumulative fatigue that is a hallmark of Itzulia. At 174.1 km, this is the longest stage of this edition. Km 110.2, Alto de Sollube: 2nd category, 8% avg. Km 160, Alto de Vivero: 2nd category, 8% avg.